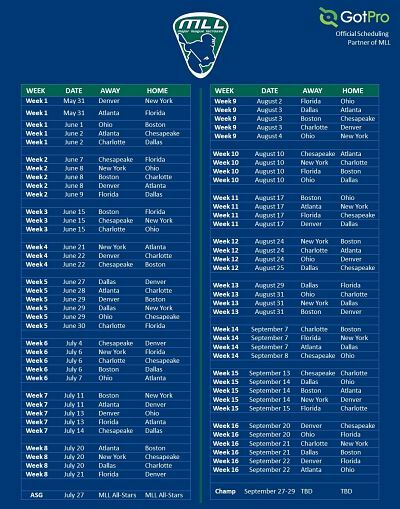 BOSTON (November 29, 2018) – Major League Lacrosse announced today a robust 2019 regular season schedule, opening during the weekend of May 31 – June 2, that includes a five game slate highlighted by the defending champion Denver Outlaws facing the New York Lizards. 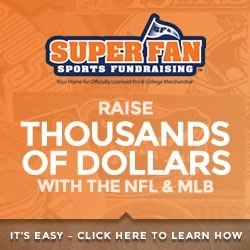 The 2019 schedule includes many changes advocated for by the league’s players, including a season start date after Memorial Day and an emphasis on playing weekend games. In addition, each team will play each other twice, the first time that has occurred since 2015, before the league expansion to include the Atlanta Blaze. In conjunction with its schedule announcement, MLL will continue its partnerships with both ESPN and Lax Sports Network (LSN) to bring games to screens across the country. ESPN, via its ESPN+ service, will feature a Game of the Week. The league’s All-Star Game, taking place July 27, will be broadcast on ESPN2, while the Championship on September 29, will be shown on ESPNEWS. The All-Star game will be played in Navy-Marine Corps Memorial Stadium on July 27th. Championship Weekend will be September 27th – 29th and the location will be announced at a later date. In addition to the Outlaws-Lizards match, MLL opening weekend will see the Atlanta Blaze traveling to face their Southern rivals the Florida Launch on Friday, May 31. On Saturday, June 1, the 2017 champion Ohio Machine travel to face the Boston Cannons, one of the league’s original franchises. Closing out the opening slate on Sunday, June 2, the Blaze will face the Chesapeake Bayhawks and the Dallas Rattlers will host the Charlotte Hounds. The 2019 schedule features 58 weekend games and only 14 weekday games, something players and fans alike called for. In addition, the league took player input into account in limiting doubleheader weekends. Other schedule highlights include the Outlaws opening their home slate with a 2018 championship game rematch against the Dallas Rattlers on June 27. In what has become a league tradition, the Outlaws will also host their annual Fourth of July game. Typically, the largest regular season game of the year with crowds between 20,000-30,000, this year’s edition will feature a 2018 semi-final rematch against the Chesapeake Bayhawks. The league partnered with GotPro, a sports software company, in creating this year’s schedule. This state-of-the-art scheduling software helped find the best slate of games given each teams’ specific needs. GotPro is a sports software company who specializes in providing the most robust software for organizations to run their leagues, referees, players, etc. They provide powerful, tailor made software products to fit any league or organization’s needs all under one umbrella. Their clients include: Major League Soccer, United Soccer League, Major League Rugby, Chinese Basketball Association and Cricket Australia.